This is a trick that Pavel Datsyuk used when he was younger and I bet a handful of other NHL hockey players have used this stickhandling trick as well. Before I go into any more detail, I will show you how to make your own weighted hockey stick. 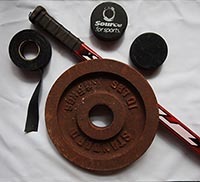 In order to make your own weighted hockey stick you will need an old hockey stick, some hockey tape, two hockey pucks, and a dumbell. You want the pucks a few inches above where the blade meets the shaft. The reason you want to do this is to stop the dumbell from sliding all the way down the shaft and interfering with your stickhandling. Put a good amount of hockey tape around the pucks, and especially around the bottom of the pucks, so that the pucks do not slide down your shaft. Now all you need to do is grab the dumbell and slide it down the shaft of the stick. 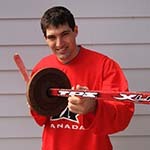 There you go, you have just made your own weighted hockey stick, now of course you are going to want to use it. I have heard of a lot of pro hockey players who have done this, and I noticed a HUGE difference after a few weeks of using a weighted stick. I have made a video with some drills you can do and also written an article. I hope this helps you with your stickhandling, check out my weighted hockey stick drills article to see what the benefits of using a weighted hockey stick are! Here is a video I made that shows how to make a weighted hockey stick, in case you don’t like to read! Instead of having the big bulk on the end i just took the cap off at the end of the stick and filled it with a mix of sand and water leaving 2 inches between the top layer and the top of the stick. This way it weighs it down without having something bulky on the outside plus the sand and water move with the flex. It has improve my stick handling and forearm strength a ton by using it. Just don’t leave it in the garage in the winter or it will freeze and your twig will snap. Thanks for the tips. I’ve been using peel-and-stick vinyl floor tiles on cardboard, but I was curious to see what other people use. It works very well for a ball and decently for plastic training pucks, but without lubrication, an ice puck is useless. Silicone spray works well for a short time. Furniture polish and Teflon spray not so much, but make it a little better on the plastic pucks. The tiles cost $12 or $15 (US) for a pack of 10 and they’re 18″x18″. The cardboard I had laying around. I use interlocking exercise mats. Yeah, it can be a little tricky sometimes when the ball goes over the cracks, although it doesn’t happen too often or crazily. In any case, I write that off as the same kind of quick reactions you need to develop for use when the puck hits unexpected imperfections on the ice. The best part for me, having a relatively small living area, is that the mats are easy to store and re-shape around furnishings. I enjoy your tips and videos, Jeremy. There are a few options out there for ice alternatives. A few sites and stores offer fake ice, which can be a bit expensive. When I was living on a farm I got a piece of old linoleum flooring and stapled it to the floor (of the barn) That worked really well and was free. Just keep your eye out for something that is smooth and has a big surface area. If you can not find a really smooth surface just use a ball on asphalt or concrete, and make sure you tape the blade of your stick so it doesn’t wear out. What kind of surface do you recommend to practice on if you don’t have access to ice? Another idea for a weighted hockey stick is just to buy a cheap composite stick and lop off the top to gain access to the hollow shaft. You can then fill the lower portion of the shaft with sand or ball bearings. If you dont want the weight to shift you can pour a little epoxy down the shaft to hold it all in place. It is not wicked heavy, like a ten pound weight but it is an option.